The Hartford Dental Society (HDS) will hold its 119th Annual May Banquet on May 25, 2016, at the Pond House in West Hartford, CT. In addition to the installation of the 2016-2017 Board of Directors, the group of nearly 100 dentists and guests will award Dr. William A. "Bill" MacDonnell with the 2016 Professional Achievement Award. Dr. MacDonnell is a dentist-anesthesiologist who maintains a mobile anesthesia/sedation practice. He has worked with more than 200 Connecticut dentists, caring for patients across the state. His expertise is in sedation/anesthesia, local anesthesia, and medical emergencies. Bill graduated from Georgetown University Dental School and completed his dental anesthesia residency at the University of Pittsburgh. 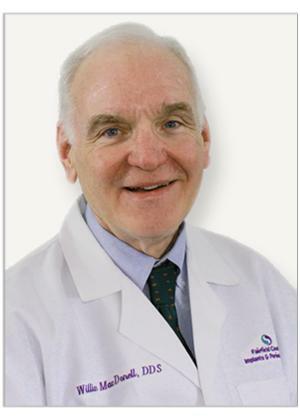 He was an assistant clinical professor of anesthesiology at the University of Connecticut Health Center and served as a staff anesthesiologist at the John Dempsey University Hospital for five years before going into private practice. Bill continues to be active in academia as a member of the University of Connecticut School of Dental Medicine clinical faculty, an appointment that began in 1978. He is a member of the Tufts School of Dental medicine clinical faculty. A past president of both the Connecticut State Dental Association (CSDA) and the American Society of Dentists Anesthesiologists, Bill is dedicated to the welfare of not only patients but also his fellow dentists. For several years, he chaired the CSDA's annual state convention, CODPAC, ADPAC, and was also a member of the House of Delegates of the CSDA and the American Dental Association. Stated HDS President Dr. Kevin C. Purviance, "Dr. MacDonnell an excellent example of an active and engaged member; this award is certainly well-deserved. We are pleased to be able to recognize and thank him for his many contributions to the profession." When not practicing or teaching at UConn School of Dental Medicine, Bill is very active in civic activities. A former chair of the West Hartford Substance Abuse Commission, Bushnell Park Foundation, he currently serves on the Cedar Hill Cemetery Foundation and the Connecticut State Dental Association Foundation. He also has been instrumental in the restoration of the Hartford monuments to Horace Wells, the Discoverer of Anesthesia. A resident of West Hartford, Bill grew up in Windsor, Connecticut, where his late father, Edward MacDonnell, practiced dentistry. He and his late wife, Margie, have four children and three granddaughters. The Hartford Dental Society, a 501 c 6 nonprofit organization, was established in 1899, with a mission to cultivate the science and art of dentistry and all its collateral branches, elevate and sustain the professional character of its members, and disseminate knowledge pertaining to the advancement of health. HDS is governed by a board of directors and is managed by Association Resources, Inc., a full-service association management company based in West Hartford, CT. Learn more about HDS at www.hartfordds.org.